We can’t help but get nostalgic thinking about growing up in the 1990s. Thinking of those days reminds us of the music, fashion, heartthrobs, toys, and TV shows that made the ’90s totally rad. 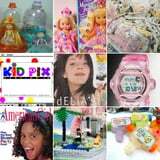 So let’s take a trip down memory lane to our ’90s girlhood, from Ring Pops, 90210, and Tamagotchis to stick-on earrings, Devon Sawa, and Titanic. Check it out! Related: You Can Now Stream Doug, All That, and More Classic &apos;90s Nickelodeon Shows – Yes, Really!